Working in stone quarries can present some of the most challenging environmental conditions on the planet for both man and machine. Extreme heat in the summer, followed by extreme cold in the winter, along with large amounts of dust when it’s dry and excessive mud when it’s raining or snowing; each create a unique set of adverse conditions. A well designed piece of equipment will not only withstand these conditions, but also help operators deal with the elements while maintaining productivity that the job requires. This is exactly the case for the Park Industries RAPTOR quarry line drill. The RAPTOR is designed for drilling a straight row of holes in dimensional stone quarries so the stone can be split into manageable square blocks. The RAPTOR is a self-contained drilling rig that works in challenging conditions and varying geological formations while keeping the operator comfortable and safe inside a climate controlled cab. An integral part of the RAPTOR’s hydraulic drill system is the VMAC hydraulic drive air compressor system. It is a 100% duty cycle rotary screw air compressor, which means it provides its promised 40 CFM of air continuously, all day. And the RAPTOR puts in long days. The machine works straight 8 and 12 hour shifts, which means the VMAC hydraulic drive air compressor system is working right along with it. The VMAC system is used to “flush air”, which means that as the drill bit penetrates the stone, compressed air is forced down through the drill bit, removing stone cuttings from each hole. The first system has drilled over 217,000 feet of holes, and the VMAC compressor has maintained clean holes the entire distance. In addition to its reliability, the VMAC air compressor system’s small footprint made it an ideal fit as there isn’t a lot of spare room on the RAPTOR for additional equipment; it is purpose-built, with every aspect providing a job-related function. 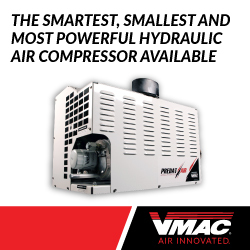 The VMAC air compressor system is 50% smaller and lighter than its competitors, which is perfect for the RAPTOR’s limited space. The RAPTOR is the only system of its kind, and was designed to reduce drilling costs while maximizing productivity. Additionally, it is the only system that truly removes the operator from those challenging environmental conditions as all drilling operations are managed within the operator cab with a camera alignment system. The protection of the climate controlled operators cab dramatically reduces safety issues caused by environment, and enables the operator to work safely for longer continuous periods of time. For extreme environments and working conditions, the RAPTOR is also remote control capable. 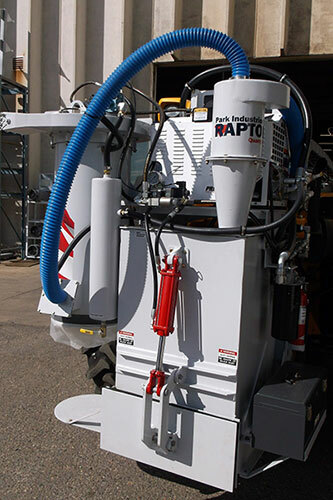 The RAPTOR represents a new market for the family-owned Park Industries, which has been in the stone fabrication business for more than 60 years. Its focus in the early years was on machine development for finished stone working equipment. They matched this with second-to-none customer service, including 24-hour a support line, which allows customers to reach actual people at all times. Developing machines for the quarry and drilling side of the stone industry is a new venture for Park Industries which is what led to the development of the RAPTOR. With Jim Fuchs’ past quarry experience and Park Industries experience designing machines for the producers of stone products, it was a natural evolution for the company. The RAPTOR has been available for over a year and can fulfill the drilling needs for most types of open pit stone quarries such as sandstone, granite and limestone quarries. 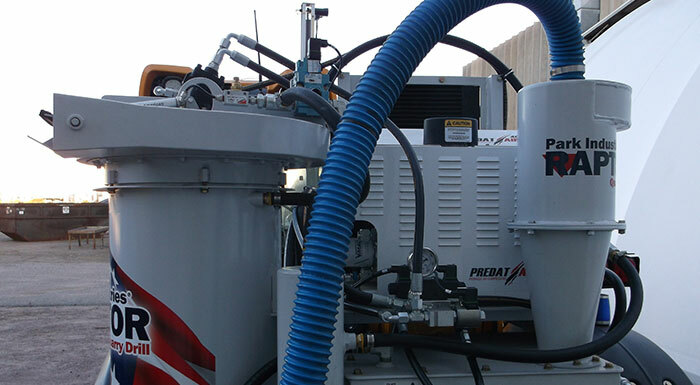 With the help of the VMAC hydraulic drive air compressor system, Park Industries RAPTOR quarry drill answers an industry need that previously had no solution. Click here for more information on Park Industries RAPTOR quarry drill or here for info on custom OEM solutions with VMAC air compressors. If you have any questions about this article or anything mobile compressor related, please contact us.